Who could think there would be a time video conversion will come with great convenience. The Wondershare Video Converter Ultimate application sure makes that a reality. This video converter produced by Wondershare helps achieve various video-related tasks. But what you don’t expect are the outstanding features that come with this video converter. The features as outlined below just make this unique application to be a form of Pandora box that holds unimaginable treats for its users. Burn Video: Contrary to what some would think, the video converter possesses an inbuilt video toolbox and burner. So, it eliminates the need to go looking around for a suitable video burner after completing your conversion task. Superb video editing: A known fact is that not all video converters have an option for video editing. But the Wondershare Video Converter is just a total package in one. 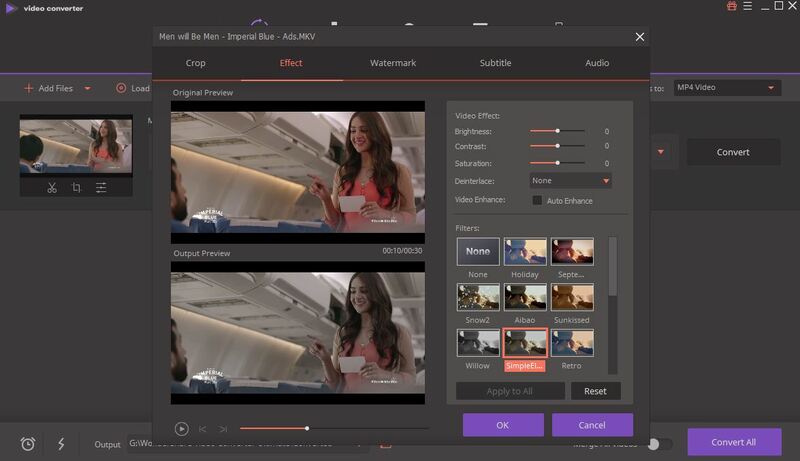 With its fabulous video editing feature, you now have the chance to edit desired videos to specification conveniently. The common complexity experienced in must video editing applications has also been addressed in this video converter as you need no specialized training to produce a top-notch video. Support 1000 formats: Another strong point for this cutting-edge video converter is its awesome compatibility with 1,000 unbelievable formats! It simply erases the unavailability of video formats, and this means you can now produce your video with any format of choice. Simultaneous Batch video processing: Efficiency happens to be core considerations in the invention of this video converter, and this because of its capacity to process multiple videos simultaneously without compromising on the quality of output. Super-fast processing: One would think the availability of abundance features in this video converter will affect the rate at which it functions. But Wondershare Video Converter Ultimate comes with a superfast processing capacity that doesn’t slow you down when executing any task. Screen recorder: This feature offers the opportunity of capturing or recording your on-screen activities. The infusion of screen recorder option in this video converter happens to save you some bucks, as you don’t need to go after stand-alone software that can execute the same function. High-quality DVD Maker: This application opens you up to the opportunity of making flawless DVDs of top quality. And its video toolbox makes the versatility of Wondershare video converter a must-have for those that desire quality and convenience. Gif maker: Have you been searching for means to create GIF picture to no avail? You need not worry as this excellent video converter comes with an inbuilt GIF maker, and this means you can get more creative in meeting your various audio-visual goals. Other stunning benefits that the Wondershare Video Converter Ultimate brings to the table include the ability to download videos from YouTube and record desired videos from streaming websites among others. You should also know that this video converter comes as compatible versions for both Windows and Mac systems, have a simple-to-use interface, and comes with free DVD templates. Are you wondering the whole package is too good to be true? Then, the free trial of Wondershare video converter Ultimate is available to give you a glimpse of its powerful functions. Try it out now, and experience its excellent video making experience.